Newspaper Club didn’t think they had a hope of following Shepard Fairey’s Obama poster and winning the Graphics category at the Brit Insurance Design of the Year 2010, writes Chloë King. It was always going be a tough choice for the judging panel: how to follow a campaign that became perhaps the decade’s most definitive image? But their selection was smart. 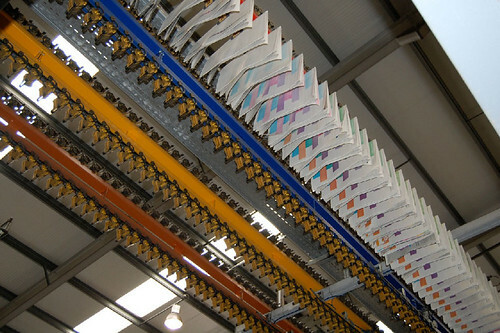 Instead of choosing a single work, they commended the realisation of a system that helps amateurs and professionals publish good-looking printed matter at an affordable price. The timing is perfect, too. The award comes just weeks after Newspaper Club was ‘launched in beta’. And as Ben Terrett – who founded the project with friends Russell Davies and Tom Taylor – explained, it feels simply ‘amazing’ to win. You can see all the nominees at London’s Design Museum from now until 6 June 2010. The overall winner will be announced on 16 March. 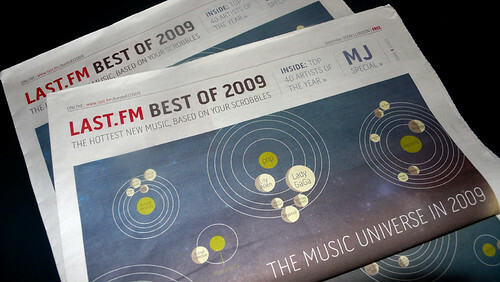 The idea began with a publication the trio made in January 2009. They published 28 of their favourite blog posts cheaply in a newspaper format and distributed it among friends. They found their market when they advertised the remaining 900 and saw them claimed within 36 hours. 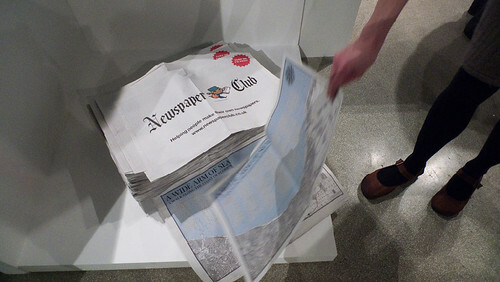 Newspaper Club’s goals and services and ambitions have been refined through prototyping, and investment from 4ip. One example, the Postcode Paper, provides clear access to government data targeted for people moving to a new locality. Although it was started ‘just to show what could be done,’ the project is still in development, and now with support from The Guardian and Data.gov.uk. Clients for their bespoke service (in its pre-launch phase) have included the BBC and Penguin, but the excitement lies ahead. 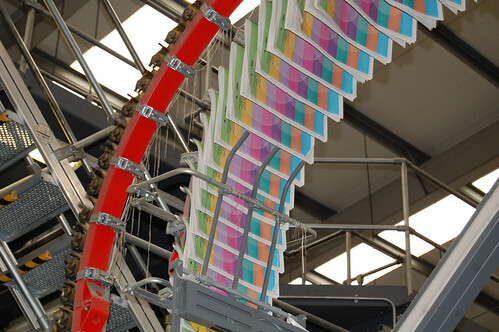 Signed-up users can print a run of between one and 5000 newspapers using the Newspaper Club template software ARTHR, or by uploading their own pdf. Fair enough, but it seems to me that for taking some giant steps to democratise print, the Newspaper Club is here to stay. Above: Things Our Friends Have Shot On Flickr. 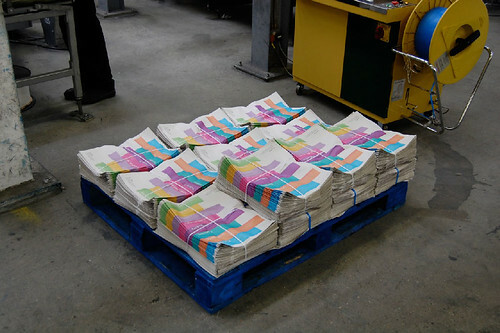 Below: 8 on press and pallet, a bespoke newspaper for the BBC. 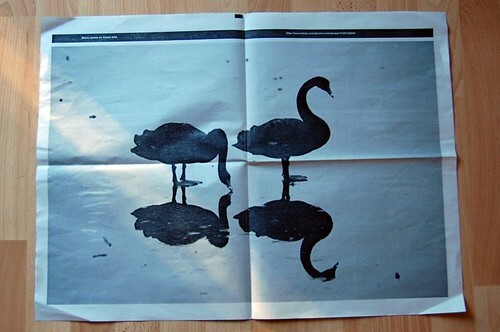 More information at newspaperclub.co.uk. More about Brit Insurance Designs of the Year at designsoftheyear.com. 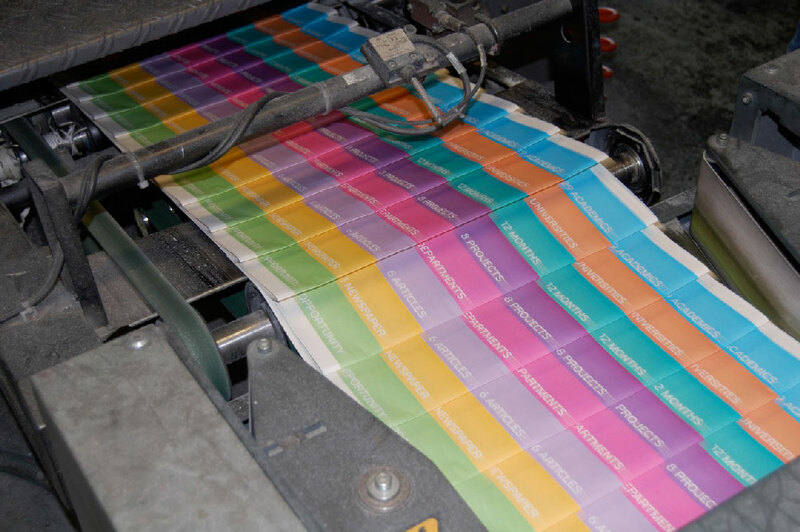 Eye, the international review of graphic design, is a quarterly journal you can read like a magazine and collect like a book. It’s available from all good design bookshops and at the online Eye shop, where you can order subscriptions, single issues and classic collections of themed back issues.